There’s nothing that we love better than Cooking out with family and friends. I’ve put together some amazing Summer Cookout Ideas that include appetizers, salads, a main course, desserts and some refreshing drinks. 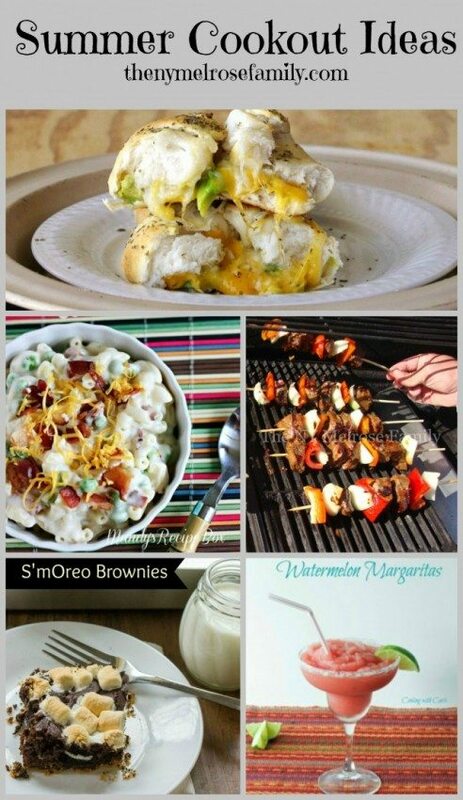 It’s an ultimate guide for Summer Cookouts! Jenny, thank you for including my smoothie recipe! OK, you have now made me TOTALLY HUNGRY with all these great posts. Forgot to leave my URL! Loving this list, Jenny!! Toasted marshmallow ice cream?! I must make soon 🙂 Thanks for including me! Thanks so much for featuring my crock pot pulled pork taquitos! Wow. These look great! Can’t wait for summer! I love this round up!! Summer food is all I can think about right now. Pinning!! Thanks for sharing my S’mores Sundaes! So fun to be a part of this post! Great roundup, Can’t wait to take the cooking outside! What a great post! Tons of wonderful ideas here…thanks.